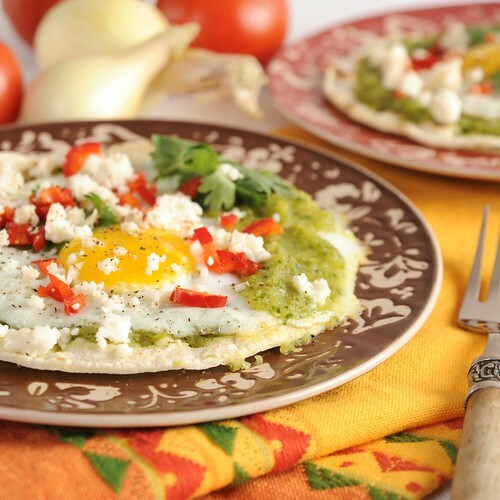 One of my favorite go-to dishes of all time is huevos rancheros. I have been making Huevos Rancheros constantly for 35 years! It is one of my easy go-to summer dishes. It is a seriously delicious dish with a perfect balance of everything: sweet, salty, creamy, fresh, bright, homey, spicy, comforting, fulfilling. And the very best thing about it? It can be ready in just a few minutes flat. I decided to switch up the sauce to try a lighter summer-fied version in honor of Sneak Some Zucchini on to Your Neighbor’s Porch Day tomorrow. The freshness of the zucchini and summer veggies makes this worthy of adding to you weeknight go-to Breakfast for Dinner list. Just throw some zucchinis, jalapenos, tomatillos, onions on the grill until lightly charred. Then, whirl them in your food processor. Add lime juice, just a little salt and some honey for sweetness and cilantro at the end for freshness. Add in a dash of cayenne pepper sauce if you want a kick. Such a delightful summer sauce! Then, toast a few corn tortillas on your grill or in a dry skillet. Ladle on the tortillas a thin layer of refried beans, your sauce, a cooked egg, some diced chiles, a little red bell pepper and some crumbled queso fresco cheese. Summer perfection on a plate! Lightly spray zucchini, onion, tomatillos and peppers with canola oil. Grill over hot grill until skins begin to char and vegetables are cooked through. Place all ingredients except honey in a food processor and process until smooth. Taste and add honey as desired. I’m coming for breakfast! Here in the Northeast, we don’t get breakfast like this. OOoooh – I would love to have you sitting at my table! This was my inspiration to come up with what I did. Thank you!